Asia, eight, is celebrating winning an Easter egg hunt held at the launch of new charitable community centre, the Terence Brown Arc in the Park in Canning Town. The new centre, run by community charity Ambition, Aspire, Achieve (AAA) and named after Terence Brown, chairman of the Sahara Care Charitable Trust, has been set up to provide new opportunities and sustained positive outcomes for local disabled and disadvantaged youngsters. 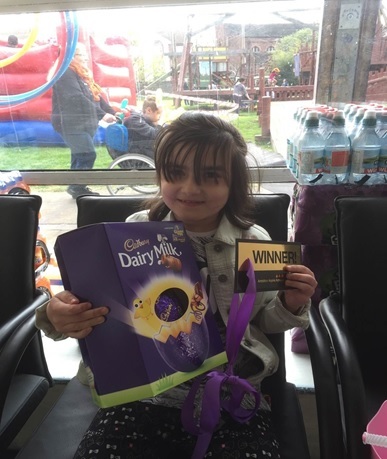 At its grand opening on 12 April 2017, 100 Cadbury’s Creme Eggs and a golden ticket were hidden across the community centre and young Asia won a giant Easter egg after discovering where the lucky ticket had been hidden. Other children who attended the event also enjoyed balloon animals, face painting, ice cream and refreshments, while their parents had an opportunity to meet with football legend, Sir Trevor Brooking, who officially opened the centre’s doors. The opening of the Terence Brown Arc in the Park was made possible thanks to a donation of £36,000 from Terence’s close friend and fellow Trustee Sharon Kaur, founder and managing director of Sahara Care, the leading care group behind the Trust. Sharon Kaur, Managing Director of Sahara Care, added: “This centre will provide a fantastic resource for local children with special needs and will hopefully provide them with some fantastic opportunities to learn new skills and gain more confidence. “The grand opening was great fun and I would like to congratulate Asia on winning our Easter egg challenge!